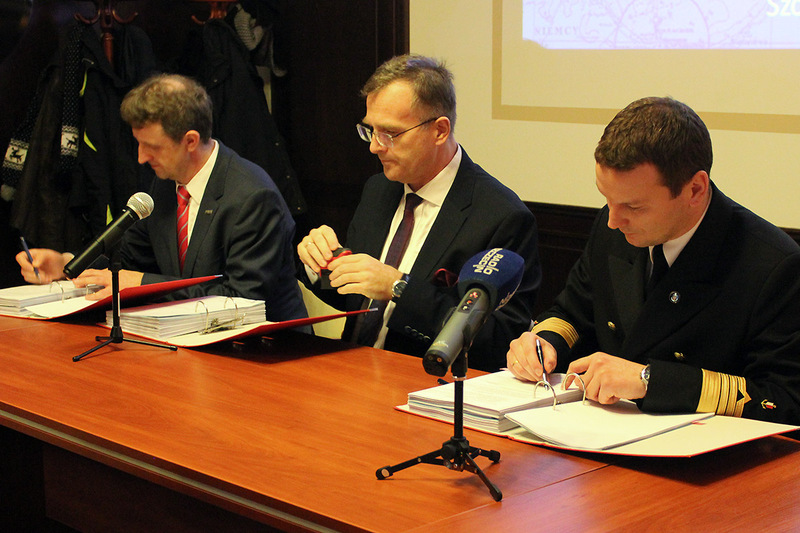 On March 5, 2018, at headquarters of Szczecin Maritime Authority (Urząd Morski w Szczecinie), a contract was signed for construction and delivery of two multipurpose vessels for Maritime Authorities in Szczecin and Gdynia. The contracted vessels will be built at Remontowa Shipbuilding SA, according to design developed by Remontowa Marine Design & Consulting (RMDC) – both based in Gdańsk and being members of Remontowa Holding Capital Group. The contract signed is resulting from technical dialogue and conclusion of a tender. On December 22, 2017, the choice of the best offer was announced by Szczecin Maritime Authority, within the procurement procedure PO-II-370/ZZP-3/36/17 concerning granting the public order for: “The construction of two multipurpose vessels”. The best offer chosen was the one from Remontowa Holding member – Remontowa Shipbuilding SA yard of Gdansk. The offer was reported to fulfill all the tender requirements, obtaining 100 points according to defined criteria. The contract was signed by Piotr Dowżenko, president and Dariusz Jaguszewski, member of the board, representing Remontowa Shipbuilding SA yard and by Wojciech Zdanowicz, head of Szczecin Maritime Authority. The delivery of the two vessels is expected until June 2020. The vessels in question will be newbuildings no. B618/1 (IMO 9851866) and B618/2 (IMO 9851878). 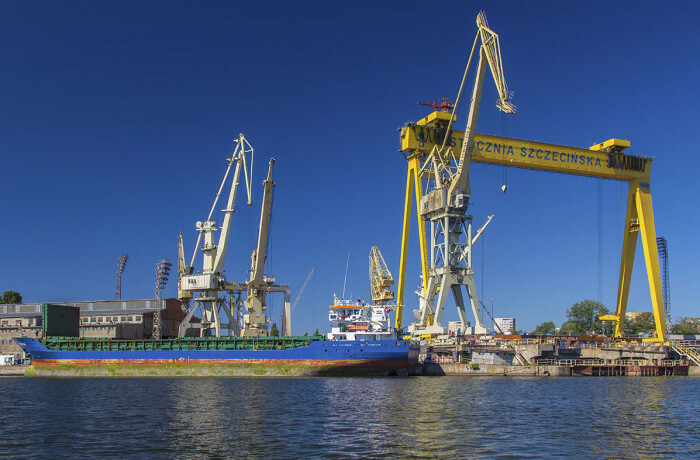 Multipurpose vessels in every-day operations will be performing the key statute tasks of the Maritime Authorities in Gdynia and Szczecin, mainly the maintenance and renewal / updating of waterways signage (buoys, etc. ), i.e. the transport, replacement (hauling and launching), replacement and inspection of buoys. The vessels will be also outfitted for hydrographic tasks (including depth measurement, data processing, map amendment), etc. In case of emergency at sea they will be capable of emergency response, sea towage, oil spill recovery, firefighting and other rescue (SAR) and salvage tasks. During winter they may be used for iced waterways clearance / icebreaking. 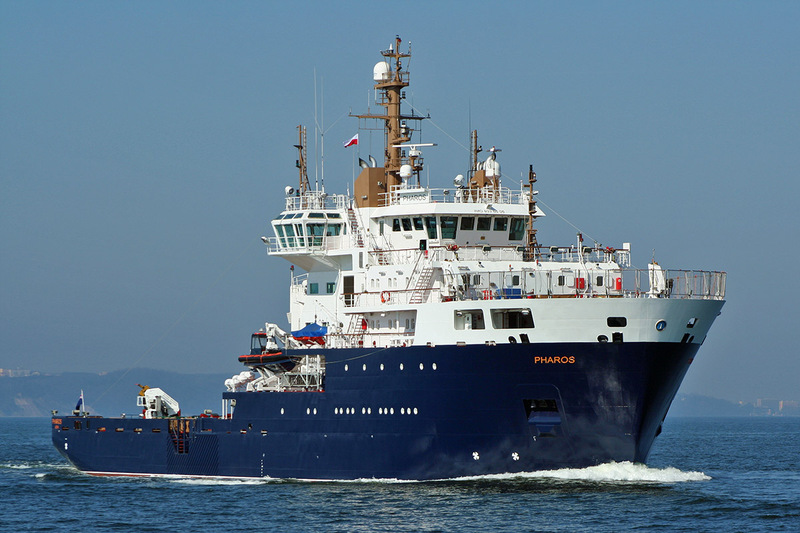 Ice strengthening and features of sea-going icebreaker will enhance their year-round buoy tender capabilities. 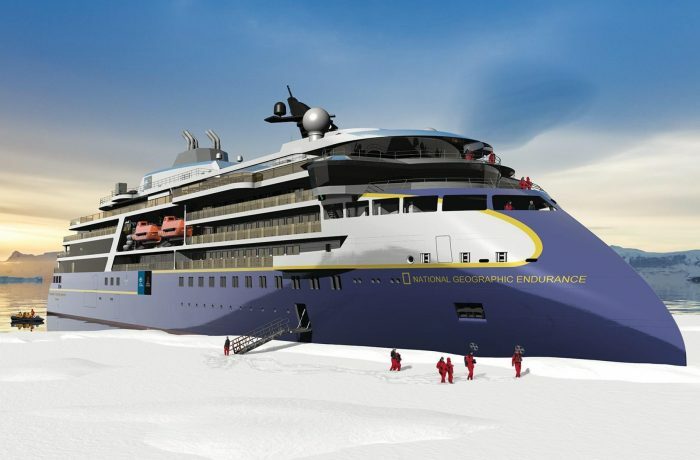 The design has been developed by Remontowa Marine Design & Consulting (RMDC). The new vessels are about to replace aging buoy tenders of the B91 type, delivered also by Stocznia Północna (currently Remontowa Shipbuilding SA) – Planeta and Zodiak (approx. 61 m long, 11.8 m wide, with 3.2 m draught and gross tonnage of 905/750), put into operation in 1982. Each of the new vessels will be approx. 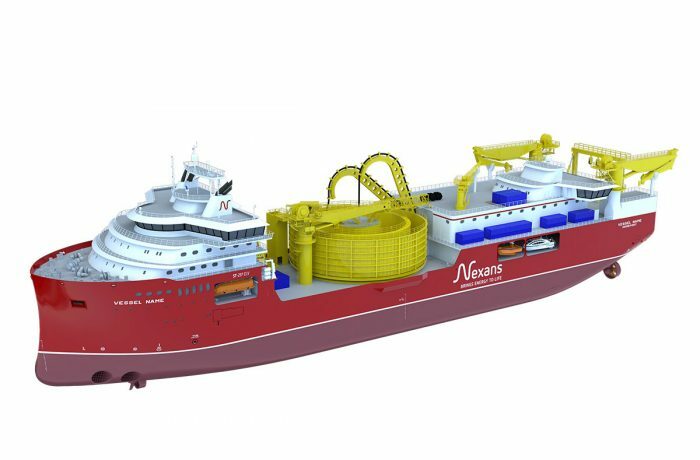 60 m long overall, 12.8 m wide and have a draught of some 3.5 up to 4.0 m. The vessels will feature deadweight capacity of 350 t and gross tonnage of 1273. The top speed achieved will be 15 knots and the bollard pull will be 40 T.
The vessels are being designed by RMDC and will be built at Remontowa Shipbuilding SA and operated by Poland’s Maritime Authorities according to the rules and under the supervision of Polski Rejestr Statków (Polish Register of Shipping). Designing such a versatile vessel is always quite a challenge, as it requires careful balancing of priorities comparing to single-purpose, specialized vessels, requiring less compromises. With superstructure located fore, midship section and stern will offer a spacious working deck for buoy handling and storage, served by a crane with 10 t SWL and 25 m outreach. The towage capability will be effected by a 400 kN SWL towing hook. The vessel, in general arrangement, resembles an OSV, however it requires application of a hull form effective in iced waters and a variety of functionalities, besides key role as a buoy tender. Flexible diesel-electric propulsion system, with two stern azimuthing thrusters and a tunnel thruster fore will provide excellent maneuverability, further enhanced by a DP system. For fire-fighting tasks the vessel will be outfitted with two water-foam monitors, installed on superstructure, with a maximum water capacity of 1200 m³ per hour at 80 m range and the vessel itself will be protected by sprinkler (water curtain) system. Rescue tasks will be supported by rescue device for retrieving persons from water (in form of Dacon Rescue Frame or Jason’s Cradle) and MOB / rescue / workboats, to be used also for hydrographic works. The crew will be accommodated in five single berth and eight two person cabins. The vessel will also have room for short term accommodating of up to 80 rescued survivors. The construction and delivery of the two ships was entrusted to Remontowa Holding capital group member companies. The ship design comes from consulting naval architects and marine engineers Remontowa Marine Design & Consulting (RMDC). The company has a vast experience in designing OSV’s for global leaders in this sector, such as Tidewater, having – among others – a successful design of a series of 23 AHTS units on their reference list, as well as the vessels with high ice class and Polar Code compliant vessels for Danish owners. Remontowa Shipbuilding in turn is known for delivery of many complex, advanced ships of various kinds, including multipurpose buoy tenders and hydrographic vessels for demanding UK owners Northern Lighthouse Board (NLB) – the General Lighthouse Authority for Scotland and the Isle of Man as well as Trinity House – the General Lighthouse Authority for England, Wales, the Channel Islands and Gibraltar – i.e. Pharos and Galatea (approx. 84 m long, 16.5 m wide and drafting 4.25 m, featuring displacement of 4025 t, 1200 t deadweight capacity and gross tonnage of 3672) delivered in 2007, supplemented by 2006 built, much smaller, but faster, rapid intervention vessel Alert (39 m long, 8 m wide, drafting 3.45 m, with 365 dwt capacity and gross tonnage of 302). The new ships for Polish Maritime Authority will be smaller, comparing to the two bigger of these ships for UK institutions, but certainly not less versatile. 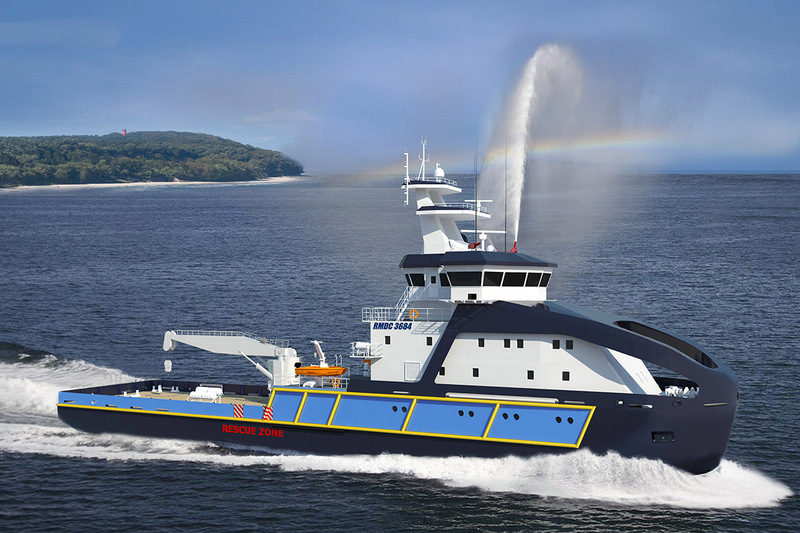 Furthermore, numerous vessel of other types built over several years at Remontowa Shipbuilding have had selected functionalities similar to ones to be effected by new vessels for Poland’s Maritime Authorities or were similarly equipped. The whole project cost was expected / estimated at up to PLN 240 m (however it is known, that contenders in the tender procedure offered somewhat lower bids, with final price understood to be in the region of PLN 213.5 m for two vessels), of which UE funds support may amount to 85 percent. The remaining 15 percent will be covered by the State’s Treasury. The EU support for this project comes from Cohesion Fund, within The Operational Programme Infrastructure and Environment (OPI&E) 2014-2020, for which The Center for EU Transport Projects (CEUTP) as an intermediate body.